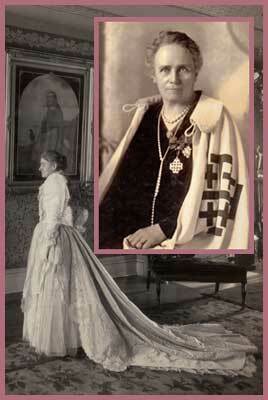 Mrs. Theresa Kulage was a wealthy, childless, German-American widow who was a daily Mass-goer and lived frugally. She supported poor priests, seminarians, seminaries, schools, orphanages, churches, missions, and monasteries. In her will she left large sums of money to more than 30 ecclesiastical institutions, but her heart belonged to Mount Grace. Shortly before her death, she wrote to Mother Mary Michael, My only desire was to establish a home for God, a place where he is undisturbed and where he is constantly being adored. No one can deprive him of this home: now it is consummated. In 1921 Mrs. Kulage came into contact with the Divine Word Missionaries and learned from them that Mother Mary Michael was thinking of making a second foundation in the United States. She approached the Archbishop Glennon of St. Louis about the matter, but received an evasive reply. In 1924 Mrs. Kulage traveled to Europe and among other places visited Steyl. She was so deeply impressed by her tour of the motherhouse in Steyl that she repeated to the Archbishop her offer to found an adoration convent in St. Louis. At last the Archbishop was convinced and invited the Sisters into the diocese. When the Mother Mary Michael accepted the offer, she did not know how generous Mrs. Kulage actually was, since she always proceeded step-by-step. At first Mrs. Kulage presented the Sisters with half of her property for building purposes: almost two acres. She would build the chapel herself but required that the Sisters should get a loan to build the convent. Mrs. Kulage commissioned the magnificent high altar out of marble and alabaster which was made in Italy. She presented the Sisters with a monstrance made out of her personal jewelry consisting of gold and precious stones. Since the convent debt was a great burden to the community which in the meantime had grown from 12 to 18 Sisters, she paid part of the debt in 1929 and by 1933 had paid off the whole of it. In December 1933, Mrs. Kulage suffered a stroke and her health began to deteriorate rapidly. She died on May 13, 1934 at the age of 72. Various newspapers published reports about her death and her work for charity, including the 1.9 million dollars she had left in her will for Church and charitable causes. During the funeral oration, the priest spoke of her great charity which illuminated her whole life. She did even more that her closest friends suspected and did it in such a way that her left hand, so to speak, didn't know what the right was doing. She could have lived in the lap of luxury but did not do so: not out of miserliness but so that more would be left over for the works of God.